This book is a very special limited book which was given for free to commemorate the benefit concert, held at the Madison Square Garden in NYC, on March 3rd, 1988. In 1986, Michael donated $1.5 million to UNCF to establish a scholarship endowment—a fund whose interest funds scholarships each year while the original gift continues to earn interest so that future students can receive scholarships. During the past two decades, more than 500 students at UNCF's 39 member colleges and universities have been able to attend college thanks to Michael Jackson's generous gift. 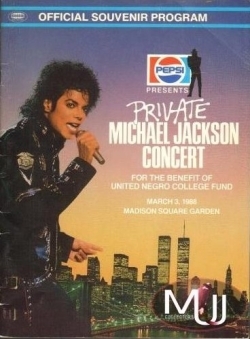 On March 3rd, 1988, Michael performed a sold-out UNCF benefit performance at Madison Square Garden in New York and donated the proceeds, $600,000, to UNCF. He also received the Frederick D. Patterson Award, UNCF’s highest honor, at the 1988 New York anniversary celebration and was awarded an honorary degree from UNCF-member institution Fisk University. That evening Michael was followed by his beloved friends: Liz Taylor, Liza Minnelli and Whitney Houston.